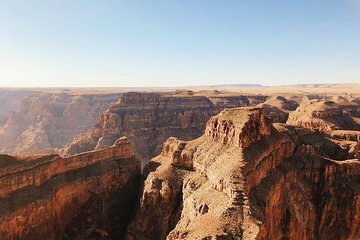 This is an affordable option if you're looking for a quick, air-only tour of the Grand Canyon. The early departures make it an especially good choice for morning people! Please Note: Passengers weighing over 300 lbs (136 kg) may be subject to additional fees at check-in. This tour is not handicap accessible but can accommodate people who use wheelchairs if they are able to get in and out of both the bus and the aircraft on their own. We are unable to store wheelchairs on the buses or at our check-in facility. Loved every minute of it...plane was clean and comfortable..staff was great..trip covered a lit of ground. I would recommend this tour to anyone visiting Las Vegas. Timely pickup from our hotel. Flight began at the time we were quoted. 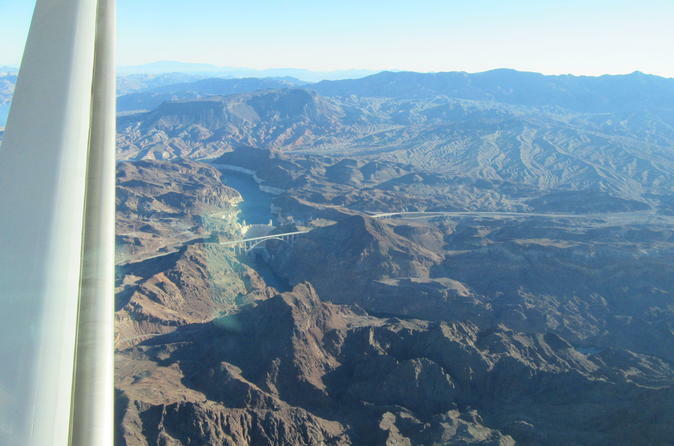 Amazing views of the Hoover Dam, Lake Meade and Grand Canyon, the only thing I didn’t like was that I was on the right side of the plane and could not see the Hoover Dam from where I was sitting. I was taking photos of our flight and got none. Everything else was top notch! we were in the front row seats of the plane and it was amazing!! each person had a window on the flight so no one was left out!! the pilots are so friendly and helpful! the tour is so amazing and extremely informative so we loved it! would highly recommend !! the pick up and drop off is very efficient also! This was amazing! From pick up at hotel all the way through to drop off I couldn’t fault it. The length of flight was just enough and the views of the Canyon spectacular! Enjoyable trip but marred by the requirement to phone for the pick-up time. In all the confusion of arranging the whole holiday to Las Vegas from the UK plus being involved with a wedding there too, I would expect to be sent an email notifying me of the pick-up time. The situation wasn't helped when I rang the phone number that was given, using my UK cell phone in the US, only to get a 'subscriber not registered' message whether I included the US international dial code or not. In the end, a 2 minute call from the hotel reception phone which was answered by a very helpful gentlemen helped sort matters out. There after, the trip from pick-up to return was a stress free, interesting and wonderful tour.